The area where Mike McGuire has suggested a train station, along this Mechanic Street parking lot. Soundview Landing, otherwise known as Washington Village phase one, on June 10. Also approved by the Bond Commission was the $10 million study on state-wide tolls announced by Gov. Dannel Malloy last week, to the consternation of local Republicans. The hoped-for Wall Street CPTV studio has not materialized, Norwalk Superintendent of Schools Steven Adamowski said in March, commenting that the Norwalk High School Media Pathway partnership with CPTV was still a go. A Media Pathway in partnership with CPTV is part of the Board of Education’s strategic operating plan. CPTV had been anticipating a $3 million grant from the state, but it was cut to $1.2 million, NPS Chief of Technology, Innovations and Partnerships Ralph Valenzisi said at the time, explaining that CPTV had a small loft studio in South Norwalk and was trying to figure out where it could place a full-fledged studio. Well, the Bonding Commission on Wednesday authorized $1.5 million for “Connecticut Public Broadcasting to assist with development of an Innovation and Tech Education Center on Wall Street in Norwalk,” according to a press release sent on behalf of State Senate Majority Leader Bob Duff (D-25). “We are striving to create another innovative learning center with the Norwalk Public Schools, which will train high school students and veterans in the field of journalism, digital media, project management and life skills. When we first approached Senator Duff two years ago, he immediately embraced this idea and has become our chief advocate,” Franklin is quoted as saying. Norwalk Board of Education Chairman Mike Barbis said late Wednesday that he didn’t know if this $1.5 million in state funding is in addition to the $1.2 million mentioned by Valensizi or if this was the grant Valensizi was expecting. “I’ll know more tomorrow,” Barbis said. Mayor Harry Rilling has spoken previously about CPTV on Wall Street, announcing in 2016 that CPTV was looking to take over the Fairfield County Bank building and use it as a film studio and public assembly place, later touting an expected connection to the Wall Street Theater. Developer Jason Milligan has a purchase agreement for the bank buildings, contingent on getting Zoning regulations changed to reduce the requirements for parking and amenities in an apartment building. Rilling did not respond to a Wednesday evening email asking if he knew where the “Innovation and Tech Education Center on Wall Street” would go. “The Innovation and Technology Center is an exciting project that will serve as a creative hub where community organizations and businesses can share ideas and resources to grow their fledgling businesses,” Duff is quoted as saying in the release. 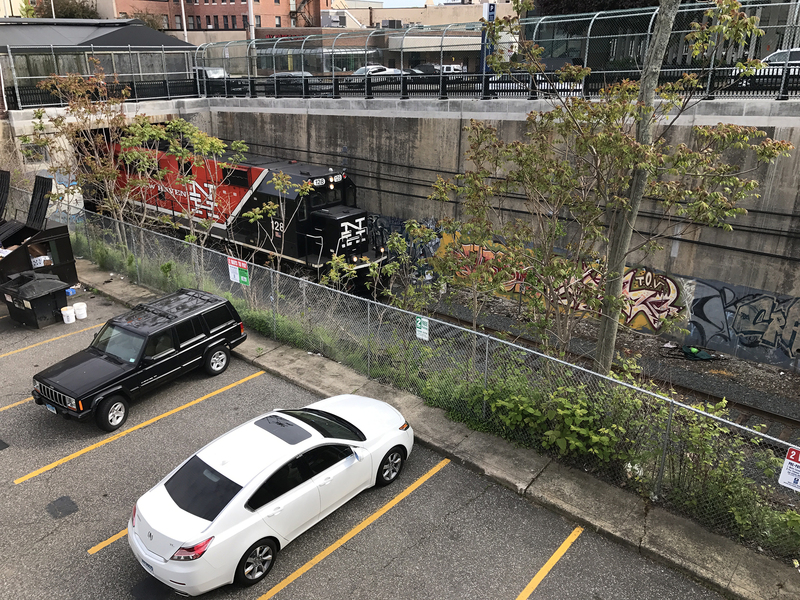 In other big news for Wall Street, the Bond Commission approved spending $250,000 to “study the feasibility of a train stop in the city-owned Mechanic Street parking lot off Wall Street, across the Norwalk River from Freese Park,” according to Duff’s release. “Wow – that’s great news! Very encouraging,” wrote Wall Street businessman Michael McGuire in an email to NancyOnNorwalk. McGuire has campaigned for a train platform in that spot. State Rep. Chris Perone (D-137) has been working for at least a year to get a study funded; a press release sent a year ago mistakenly announced that Perone had been successful, and a correction was later posted. Neither Duff nor Perone replied to a Wednesday evening email from NoN asking for more details. The State Bond Commission agenda states that the Bureau of Public Transportation requested the funds. “Providing commuters with more options will benefit residents and local business and help revitalize a neighborhood where the state, city and business community have made significant investments,” Duff said in the release. “I’m thrilled that the state is investing in Norwalk,” wrote Jackie Lightfield of Norwalk 2.0, a longtime Wall Street area activist, to NancyOnNorwalk. Not everyone supports a train station. Melissa Kaplan-Macey, Connecticut Director of the non-profit Regional Plan Association, told Common Council Planning Committee members on Feb. 1 that a Wall Street train station would be expensive and there are more practical ways to get people to the South Norwalk train station. “It’s one thing to build a station. You know, you could build a station, it’s another thing to get trains to come to it and to get them to come to it frequently, and come to it frequently on a branch line,” Kaplan-Macey said. South Norwalk’s Washington Village was also slated to receive $6 Million in support of phase two of the Washington Village Transformation Plan, which includes a new 85-unit building on the south side of Raymond Street, between Day and Water streets, Duff’s press release said. The press release was sent before the Bond Commission met; the state’s website confirms that all the proposed spending items were approved. “This phase of the project consists of separate loans supporting 4% Low Income Housing Tax Credits which will support construction of 42 units with 10 market rate units and 32 units for households up to 60% of area median income and 9% Low Income Housing Tax Credits which will support construction of 43 units with 10 market rate units and 33 units for households up to 60% of area median income. “The loans will be provided at not less than 1% for a term not to exceed fifty-five years, with payments from available cash flow. Washington Village is “moving towards a financial closing on Phase II sometime between the end of August and mid September,” NHA Executive Director Adam Bovilsky wrote in a Thursday evening email to NancyOnNorwalk. Malloy’s announcement last week that he was asking the Bond Commission to fund a $10 million study on state-wide tolls drew vociferous opposition from Republicans, including Marc D’Amelio, Duff’s challenger, and Frank Page, who is running against Perone. D’Amelio asked Duff to oppose it; Duff did not respond. The Commission approved the study Wednesday, with Comptroller Kevin Lembo voting against it as he promised to do in a press release. There’s an effort underway in the statehouse to reverse Malloy’s move, State Rep. Gail Lavielle (R-143) announced late Wednesday in a press release. Lavielle “signed a legislators’ petition this week to request a special session for the purpose of prohibiting the expenditure of taxpayer funds to study and evaluate the establishment of tolls in Connecticut,” the release said. The study would explore tolls on all major Connecticut highways, including Interstates 95, 91, and 84, along with the Merritt and Wilbur Cross parkways, the press release explained. Rilling did not reply to an email asking if he supports tolls. One more thing – the Bond Commission also approved $6 million for a Darien project. 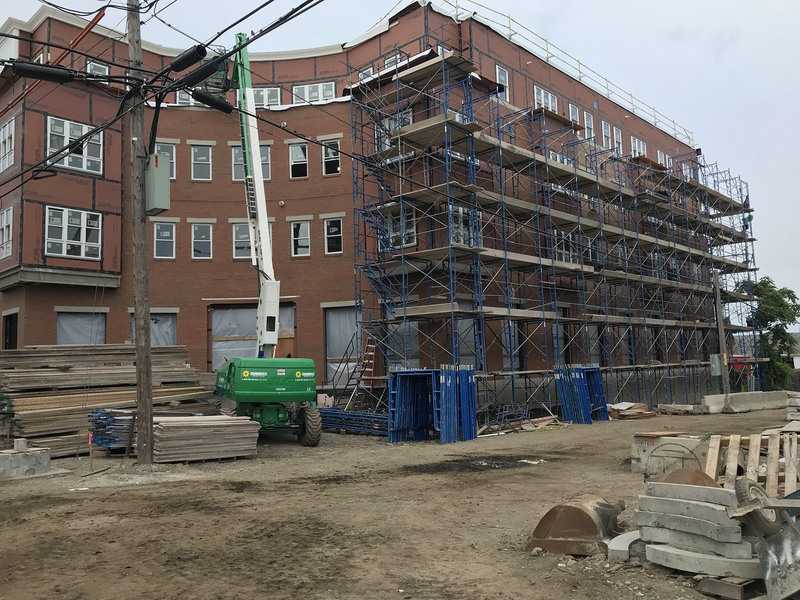 “$6 million is on the agenda for the Old Town Hall Houses — an affordable housing community for seniors – to assist the demolition and new construction of 55 affordable elderly rental units in Darien. The new, modern units will include handicap-accessible upgrades and elevators. How about money for some logistical support on the Walk Bridge project? So they approve money for “feasibility studies” but not for actual projects that need support. “Brownfield Funding $2,700,000 question on this is how off was the city on the cost of the Ryan park cleanup? Bet that money will just about cover Ryan park over sight. City hired the Ryan park lab for Raymond st it was a nice move but a stupid one with what money? does this mean real bathrooms or handicap porta potty’s or no bathrooms at all at Ryan park ? Lets all look at the pictures of the Village demo building another media used and realize people are still living in boarded up buildings with water still in the basements . Almost 300 people last count were living in Squalor conditions in Washington Village . Bob cant run on the here and now can he? Train station study is a joke , the Sono collection will have a new owner soon maybe days away , a train platform there is where the study should be going and the mall would of paid for it including the platform , throwing money away at election time is what our politicians do best. No one remembers what Perone did with the Port Authority? Grow up Norwalk the state has simply paid for another term. Wonder what kind of package Village creek and surrounding Democrats will get next, Manress was a sham amd its election time. Some of Norwalks activists are desperate and it shows. Projects before people money before common sense. Its still our money.